It's January 1931 and an express train is bound for Moscow from Vladivostok on the Trans-Siberian railroad. The train is on a peace mission, hosted by Russians with delegations from China and Japan togethr with a pair of British observers. The enigmatic Mr. Big Job; the personal bodyguard of the Ambassador of Japan is found dead in a cabin that has been locked from the inside!!! 8 fellow passengers, each hiding a guilty secret have been implicated in the murder. 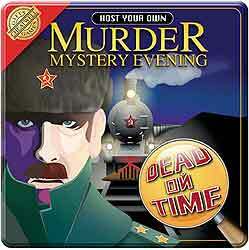 Over the course of a dinner party you must unravel the mystery and help Komrade Ivan Inkling solve this intriguing whodunnit! With each of your guests playing the part of one of the suspects on board the train, it's a battle of wits nad cunning in which you will vie to out-sleuth each other as you seek to unmask whi it was who did the dastardly deed.